Rasbihari Desai was born on 14th Oct 1926 at Vadodara in Gujarat. He inherited music as wealth from his parents. His father, Dr Chintulal Desai used to play the Dilruba and the Tabla, his mother Panulaxmi used to sing. His interest in the flute was from his childhood. He first learnt the basic notes of the flute from his elder brother and then later at the C N High School, Ahmedabad, under the tutelage of Shri Shankarao Gadre learnt the nuances of Hindustani music. He had the good fortune to play in front of Pandit Omkarnath Thakur where he played Raga Sohini. 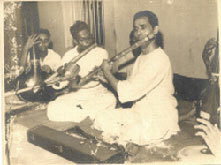 Panditji was so impressed that he told Rasbihari that, “If you really want to learn the flute, then you should go to Mumbai and learn under Shri Pannalal Ghosh. Rasbihari came to Mumbai and thus began a journey of spiritual and musical learning from the great Guruji. He learnt music belonging to the “Saini Gharana”. He had his first meeting with Guruji at AIR, Bombay in July 1948. He became his disciple since then, until his untimely demise in 1960. “My association with Guruji was more on a spiritual level, where we could understand each other even without normal conversation”, he says. He accompanied Guruji on many programmes on AIR. His high point was when he played along with Guruji at the Haridas Swami Sammelan with Pandit Nikhil Ghosh on the tabla. Guruji conducted flute classes at Bansuri Vidyapeeth in Bombay without any fees. For three years after his death, Rasbihari conducted these classes. Not only this, Rasbihari formed and conducted a flute orchestra of 12 flutes of different pitches. “This was Guruji’s personal wish, which I could fulfill”, he adds. Rasbihari adds, “Guruji was a man for whom no words can really describe his greatness, not only as a flautist but also as an extremely profound human being”. As an example he cited the case when Guruji played Raga Pushpachandrika at the AIR Sammelan before a select audience. After the programme, Shri Arvind Parikh the Sitarist and a disciple of Khansaheb Vilayat Khan, came to Guruji, complimented and said, “Babuji, yeh raga ki gat bahut achchi hai” Guruji put his hand on Rasbihari’s shoulder and told him, “ Isne compose kiya hai”. Such was the magic of Guruji. Pannababu was an ardent follower of Ramakrishna Paramhansa. This explains Rasbihari’s turning towards Yoga, which he has been practicing for the past 30 years as a student of the Yagoda Satsang Society, Ranchi. Rasbihari today, lives in Vadodara in Gujarat. At the age of 79 he still plays the flute and tries to continue doing his riyaaz for about 15 – 20 minutes daily. He also has a few students learning from him currently and like his Guruji does not charge any fees.